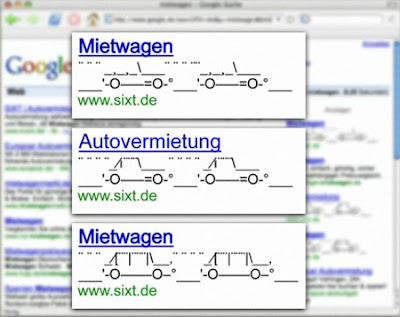 ASCII art in Google AdWords for a car rental company Sixt.de in Europe (via coolz0r). Most likely a mock-up since Google will filter out the excessive punctuation and would not show three ads from the same account on one page, but maybe it might work with other text ad companies. There's a video on Banner Blog. Advertising is, without any doubt, the most common form of art met nowadays. And should be appreciated as well, since it's not so easy to find an ad that will attract the target public.